It is well known that local mine stiffness (LMS) plays a role in the violent failure of a pillar prone to strainburst. Very limited laboratory experiments have been carried out to simulate bursts caused by a gradual decrease in the local mine stiffness resulting from excavation. In this study, an experimental study is performed aiming to provide insight into the coal burst caused by a decrease in the LMS. Coal bursts were produced using a physical model in which excavation was performed stage by stage to produce a gradual decrease in the LMS. A numerical study was then carried out to study the evolution of the LMS with excavations. 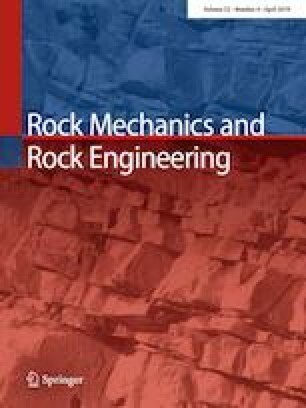 The effect of pillar strength, immediate roof stiffness, and excavation sequence was examined using the numerical model. The result suggests that the LMS at a given condition depends on a combination of various factors including pillar strength, pillar stiffness, host rock stiffness, etc. The interaction between these factors may play a key role in the LMS. It is also found that mining and excavation at the far field (e.g., mining at the adjacent panel) may not cause a great decrease in the LMS and thus is less likely to produce coal bursts at distant coal pillar. Great concern should be paid when mining and excavation activities are carried out at the current panel. This work has been supported by the National Natural Science Foundation of China (Grant No. 51774185) and the Tiandi Science & Technology funding (Grant No. KJ-2015-TDKC-06). The author would like to thank their colleagues for their assistance during the physical modeling.